Provide comfort for the family of Patricia Wright with a meaningful gesture of sympathy. 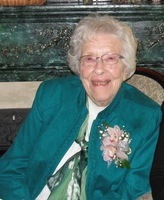 Pat passed away peacefully in Newmarket, Ontario at the age of 93, with loving family at her side. Pat was predeceased by her loving husband Thomas Allan Wright of 59 years, her parents, Robert and Hazel Long, brothers George and Robert Long, and son David Allan Wright. She will be lovingly missed by son Brian (Ingrid), grandchildren Katrina (Alex), great granddaughter Hazel, Justin (Ally), Christopher (Bryanne); son Keith (Suzanne); daughter in law Sue Christensen, granddaughters Madison (David) and Lexi (Eric); nieces, nephews, and special care givers, in particular Katelyn Hogan. Pat grew up on Rusholme Road in Toronto, and has since lived in Etobicoke, Parry Sound and Newmarket. She was an avid tennis player, bowler, and bridge player, all hobbies she shared with the love of her life, Al. She enjoyed reading, crossword puzzles and spending time outdoors with family at the cottage on Manitouwabing Lake, especially kayaking, fishing and bird watching. Their love of cottage country prompted Al and Pat to move to Parry Sound where they enjoyed their retirement. Pat has always been active in the various communities in which she has lived, making and maintaining lifelong friends and positively impacting everyone around her. According to Pat’s wishes, cremation has taken place and a celebration of her life will be held at a later date. Donations in her memory can be made to the Toronto Humane Society at 11 River Street in Toronto. To send flowers in memory of Patricia Isabell Wright (Long), please visit our Heartfelt Sympathies Store. Provide comfort for the family of Patricia Isabell Wright (Long) by sending flowers. The marriage of our two children brought two families together for many years of friendship and family celebrations. Mostly we will miss our summer visits and many enjoyable conversations at the cottage with Pat. I suspect you are playing tennis with Al or watching David win his current match. Thanks for continuing to send me signs that all is good. Running trails today I saw a red fox, 3 deer, a red tailed hawk and thousands of wildflowers from crocus to blue bells coming up through the forest floor. The rainbow leaving Toronto last Thursday, the fat Robbin staring in my window from the large pine tree. Then today I find 100 ghost Lily’s where there were three last Spring. Wishing you the greatest happiness as you enjoyed for 20 years on Skerryvore circle. Miss you. Sleep well, and play that guardian angel role when you can. We can all use help down here. I will always be thankful to have had Pat’s positive influence in my life the last 35 years, not only as a daughter-in-law, but, as a great friend. We enjoyed our weekly picnic lunches, along with the occasional game of scrabble, cribbage, and checkers. She enjoyed discussing books we’d read, especially when I introduced her to Richard Paul Evans. She always knew when to expect the return of various birds. She would have said, just recently, that she saw her first Robin, or in a few weeks, her first Hummingbird. 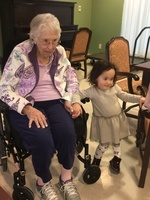 Pat loved to have visits from grandchildren and lately, her first great grand daughter Hazel. Holding little ones like Hazel and Zack brought such joy to her. Keith and family - I only met your Mom once while she was visiting the Poconos, but I recall thinking "Oh yeah...this is Keith's mom!" :-) To me, you have the same intelligence, pragmatism and sense of humour that I sensed from her. Deepest condolences on your loss.